You know me. I love to find a healthy grab-and-go snack that will keep me fueled for a few hours until it’s the next meal time. There are so many unhealthy options we are presented with, that it’s easy to get side-tracked. Potato chips, cupcakes, sugary granola bars, and the list just goes on. The awesome thing about being the main grocery shopper in my family is that I get to make most of the food-related choices in our home. When it comes to mid-day snacks, I’m definitely more apt to choose a healthy snack that tastes good and makes me feel good. One of my absolute favorite snacks is pistachios. I love pistachios because they’re delicious, nutritious and completely satisfying. In fact, with pistachios you get more nuts per serving than many other nuts – 49 kernels per ounce, compared to 23 almonds, 14 walnut halves and 18 cashews. Plus, a reduced serving of 30 pistachios makes a satisfying, deliciously healthy snack for only 100 calories! Pistachios were actually a big part of our food spread during the big football game last week, which is especially funny because of the creepy (ie hilarious) pistachio commercial that was played. On top of just snacking on pistachios, I also like to use them in some of my favorite recipes. I decided to try my hand at biscotti for a second time (the first time was a flop). Let me tell you – this biscotti is nowhere near a flop! It’s quite the opposite – and using a mix of whole wheat flour and cornmeal instead of just flour, made this a snack I can get on board with! In a large bowl, whisk flour, cornmeal, coconut, baking powder, and salt. In the bowl of an electric mixer, mix eggs, sugar, oil, and zest on medium speed until well combined. Reduce speed, add flour mixture, and mix until just combined. Fold in craisins and pistachios. Transfer dough to a parchment-lined baking sheet and pat into a 14x4 inch log. Bake until firm and golden, 30-35 minutes. Transfer to a wire rack, and reduce oven to 325 degrees. Once cool, transfer log to a cutting board and, using a serrated knife, cut diagonally into 1/2-inch slices. Arrange slices onto parchment-lined baking sheet and bake, rotating half-way through, until just golden around the edges, 15 to 18 minutes. Let cool completely. Here’s a little bit of what celebrity trainer, Valerie Waters, has to say about getting fit. I love what Valerie says about not having to do all 1-2 hours of exercise at once. This is a journey we are on, and it doesn’t have to be perfect right off the bat! To enter, you must Like the Pistachio Health Institute Facebook page and enter your name, address and contact information here: http://bit.ly/1ccjp8i. What snacks are you incorporating into your daily routine to get healthier? Oh my gosh, aren’t pistachios addicting? At least they are for me! Seriously, I’m all about baked goods that have good dunk-factor in my coffee. This biscotti totally wins that game! Every time I see a biscotti recipe, I think of our amazingly fun blogger get together. This looks delicious. Pinned! And to think, before a few months ago, I had never made biscotti before. Now I’ve made it three times! These biscotti sound so good! I love that they combine pistachios and coconut! 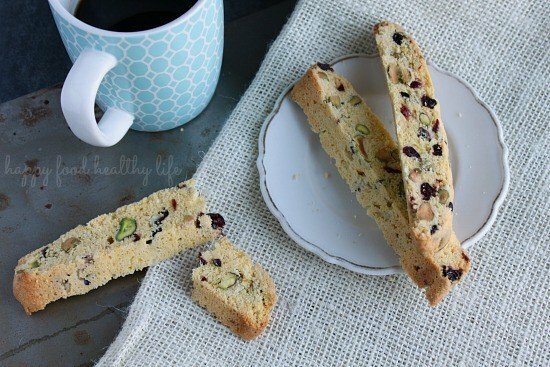 I have never made biscotti at home but I would love to try! You should totally try it out! 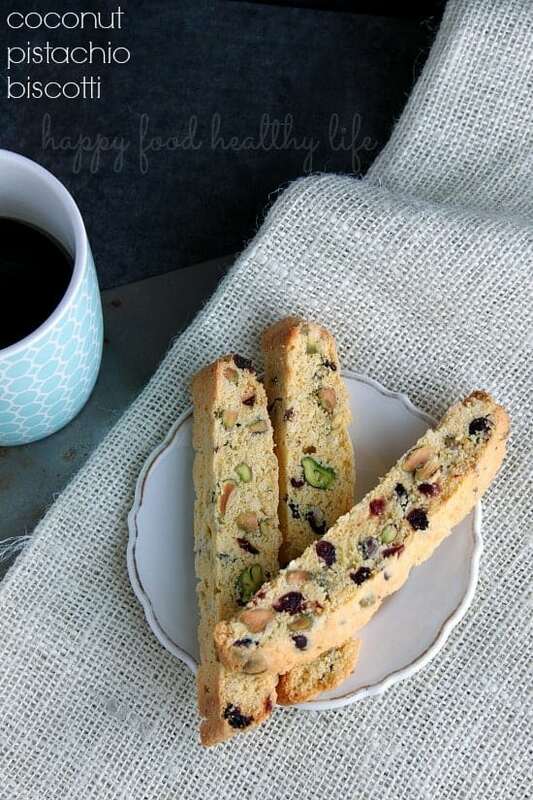 I’ve had biscotti recipes fail on me before – this one was so easy and pretty fail-proof! Those biscotti look gorgeous! I love the pop of green from the pistachios. I have to say, I’m thrilled with how they turned out!